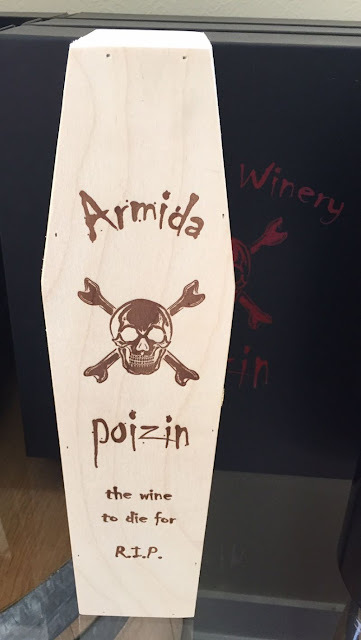 We recently went wine tasting in the Healdsberg region of California Wine Country and came across a wonderful and fun wine called Poizin (Zin and in Zinfandel) from the Armida winery. The wine comes is a regular edition with a simple label, or you can get the reserve Poizin with an engraved label, a dripping blood wax seal and its own wooden coffin. 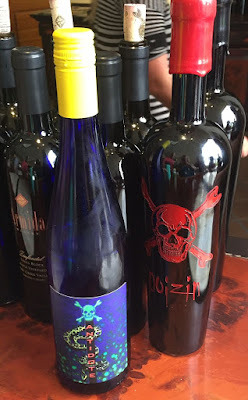 It's the perfect wine for Halloween - or a mystery blog. And if you have too much Poizin, you can always save yourself by drinking another one of their wines called The Antidote. If you visit in person, don't forget to pack a picnic. They have a lovely outdoor picnic spot by a man-made lake. This is so clever, were the glasses etched? So cool!